Besides the obvious fact that as the weather cools down our crews can work faster than in the summer heat, there are many reasons why fall is the best season to complete a roofing project. Choosing to install your roof in the fall will help you avoid more serious problems in winter. If your roof needs replacing, don’t try to get it through another winter and tackle the project come spring. Even if the problems are relatively minor, like a few small holes or minor leaks here and there, winter can magnify them to a whole new level. A major snowfall can create nightmares for homeowners with faulty roofs, since the added weight of the snow can cause further structural problems and trigger leaks and other moisture-related problems, such as ice dams, if the temperature rises above the freezing mark long enough for the snow to melt. When new shingles are installed, they need some time to seal and create an airtight barrier that will stand up to even the harshest weather. Fall days are just warm enough and long enough, so all materials will be installed under perfect weather conditions, ensuring better quality of installation and improving your new roof’s longevity. Fall, of course, is a complicated season here in Chicago. Some fall days can still see highs in the 80s, but then at the end of fall we may get a foot of snow. If you’re planning to get your roofing project completed before winter, you have to do some planning and don’t wait too long. Homeowners often ask us when is it too late to start a new roofing installation in the Chicago area. In reality, it’s more about “what’s going on outside” as opposed to what your calendar says. 50 degrees and above is great. 50 degrees and some sunshine -even better. Even if it’s 40+ degrees, we can still do a roof replacement with all the usual warranties. In fact, we’ve never had any problems with roofs installed in such weather conditions. The key is not only the temperature outside by itself, but what conditions are enough to warm up the shingles for as close to 70 degrees as possible. The shingles need to seal, and will not seal unless they warm to about 70 degrees F ambient temperature. This does not mean it needs to be 70 outside, because the shingles will warm from the sun. So when is it too late to install a new roof in Chicago? When the weather gets below 40 degrees and approaches freezing. Not only shingles will not seal in the freezing temperature, they become brittle and difficult to handle and nail. 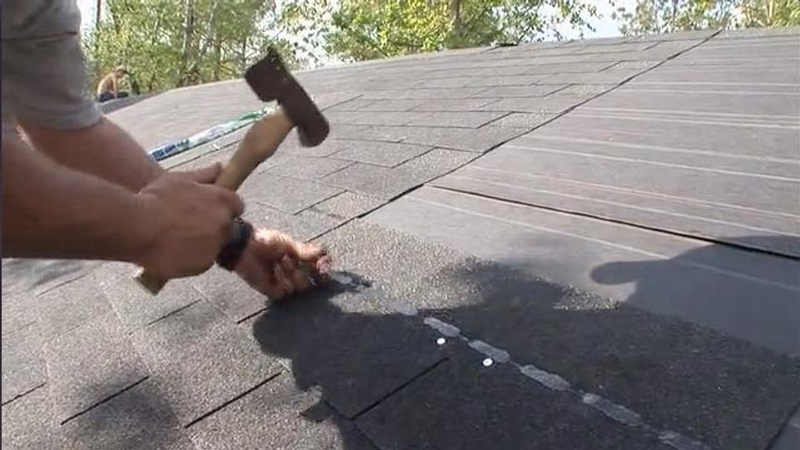 It becomes necessary to manually handle each shingle and hand-nail it to the deck. Then, proper adhesives must be used and still shingles are more prone to blow-offs. Unless it’s an emergency, for Chicago area residents, we always recommend completing roof installation earlier in the fall and avoid having to deal with it in the winter.